January 30, 2019 By Lori Leave a Comment THIS POST MAY CONTAIN AFFILIATE LINKS. PLEASE READ MY DISCLOSURE HERE. 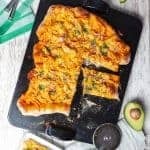 Amazing game day or dinner fare, this pizza has a good amount of heat with loads of crunch and comfort. 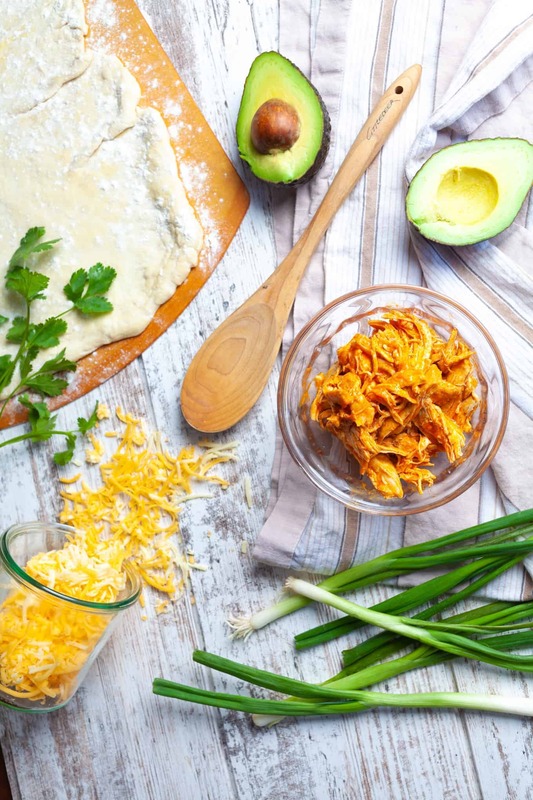 Make it simple with store bought crust and rotisserie chicken or make it your own with homemade dough and home-cooked chicken. I don’t know about your family but mine should be from Buffalo that’s how much they love Buffalo chicken wings. Really it isn’t the wings—it’s the sauce that they love. Or maybe it’s the ranch dressing that they love since they eat that on everything as well and this pizza gives them an excuse to do just that. Ok, I’m getting off track. Back to the pizza. While I love to make my own pizza dough (recipe coming), I don’t always want to or have the time. 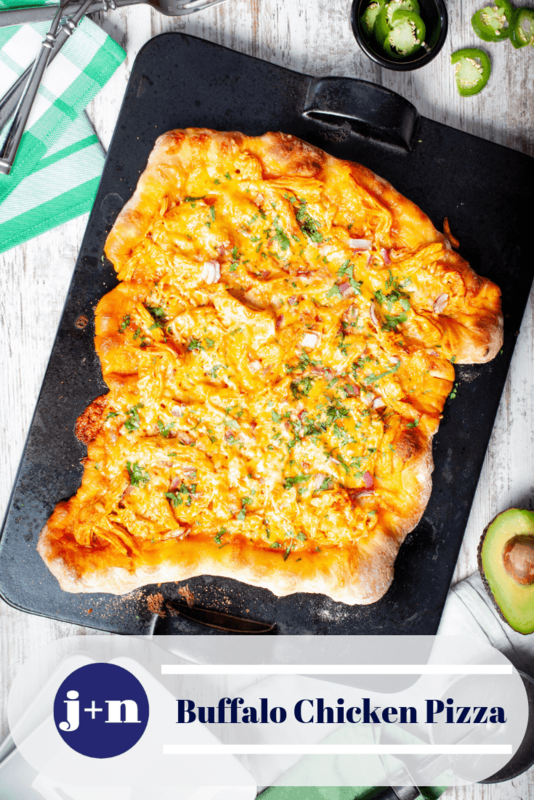 Enter once again – Trader Joe’s – my go-to for pre-made pizza dough. I love that they have three varieties: plain, whole wheat, and a garlic herb one. For this recipe, I’d go with either the whole wheat or plain. I opted for plain today – well, for no reason other than that’s the one I had in the fridge. The other key to the crispy crust isn’t just the dough. It’s the hot stone I bake it on. 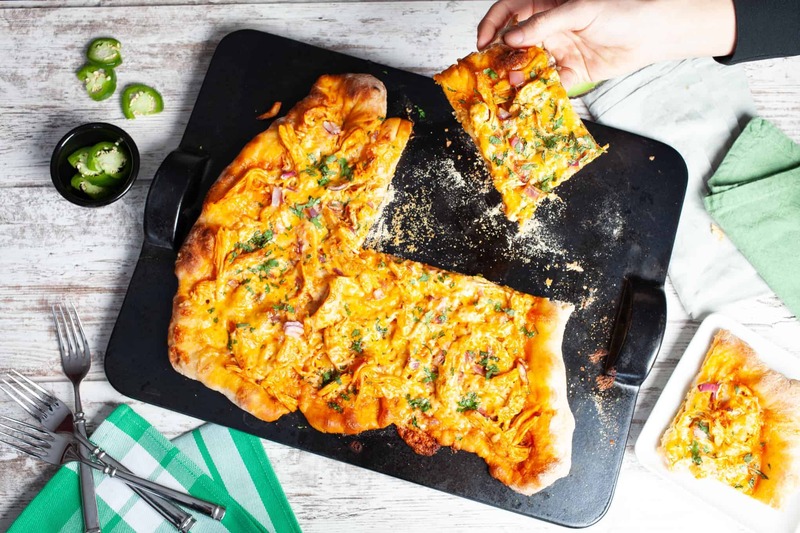 If you don’t have a pizza stone, you can still make this recipe but I will tell you it’s not an expensive investment and you’ll use it for so many things. This one in particular comes from Emil Henry and to say I love it is an understatement. First of all, it’s a hip, cool black and second of all, it always looks great. And it’s super easy to clean. Williams-Sonoma sells these in several shapes and sizes – I have two of them: a round and this rectangular one. The newer ones are even better than mine as the handle doesn’t impede into the baking space the way mine does.I want a new one now! Check them out! If you don’t have or want a stone, you can use the back of a cookie sheet or baking sheet. You won’t have to heat it for the whole 20 minutes per the recipe but I would definitely put down some cornmeal on the pan right before placing the pizza on it. Alright – the chicken. For the chicken, I start with my Foolproof Chicken Breasts recipe – I find that two-three chicken breast halves per pizza typically works depending on the size. Once they are cool, shred or pull apart the meat and toss it with the hot sauce and butter mixture. Oh yes – BUTTER. It is the key to all things Buffalo and to leave it out would be a sin. But I’ll forgive you. If you want to try coconut oil, coconut cream or coconut milk, I say go for it. I haven’t experimented with any of those yet but I definitely will. Next you assemble all of your toppings. For this I like a combination of cheeses. A Monterrey Jack, sharp cheddar and a mozzarella so you get all the melty goodness. Trader Joe’s also has a cheese trio that’s already shredded that would work just great here. For this version, I added chopped red onion, a little green onion, some chopped cilantro and a garnish of avocado. K.I.S.S—keep it simple, sweetheart! Certainly, some bacon, red pepper or even some caramelized onions would work great but you really don’t need much more than that. 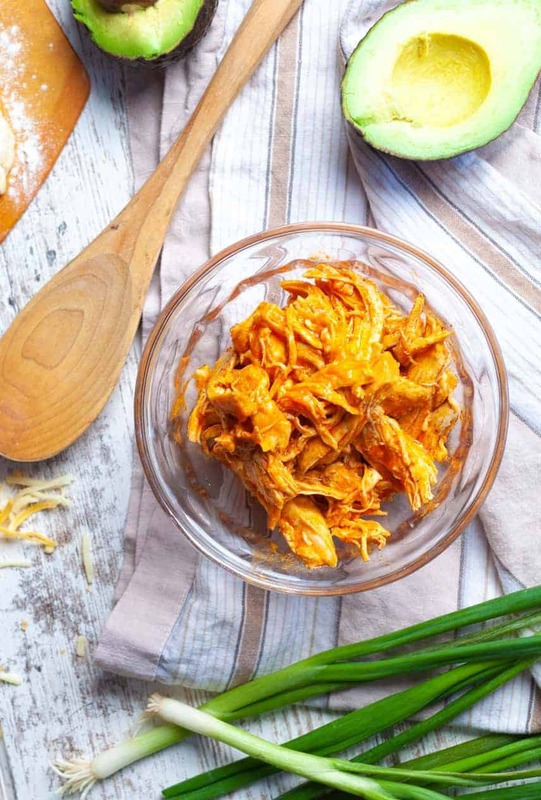 The Buffalo chicken is the star of the show and don’t forget, once you’ve accessorized with a little Ranch or Blue Cheese dressing (MY personal favorite), you’ll be set. Ok -time to roll the crust. Flour a large cutting board or pizza peel or kitchen counter (great esp if you have granite, marble or quartz) and gently stretch your dough (if it’s store bought, be sure to let it sit out on the counter to come to room temp for about 20 min or so). 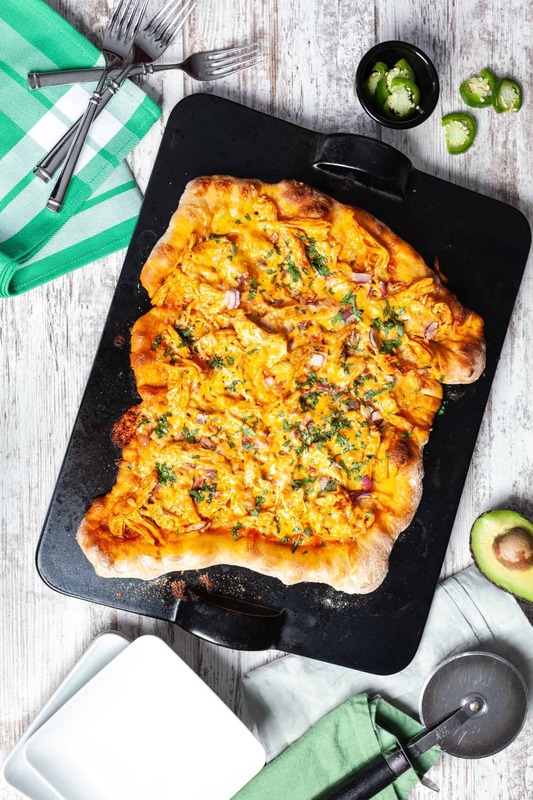 After you’ve gotten the crust to the size and shape you want it, heavily sprinkle a pizza peel or cutting board with cornmeal and lay your crust on the board. Make sure that the crust slides back and forth if you give the board a little shimmy. And while you’re at it, put on some great music and do a little shimmy of your own. Because you’ve got Buffalo pizza coming your way. Top the crust with the chicken and space it out so that there’s enough on there. You don’t want to overdo it but you also don’t want to underdo it either. Between each ingredient addition, make sure that the crust still slides back and forth on the peel. If it doesn’t, gently life the spot where it’s sticking and put on some cornmeal. Keep doing this throughout the layering process because the pizza is getting heavier and the crust is getting all cozy on that board. It’s kind of like hanging out on the couch on a cold Saturday afternoon and having to get up to answer the phone – oh yeah – that isn’t a thing anymore. When you’ve got all your toppings assembled, open your oven door and pull out the rack. Starting at one end or the back of your stone, gently slide the pizza back and forth and little by little slide the crust onto the piping hot stone or cookie sheet. Set your timer for 10 minutes. And go clean up the kitchen. Set the table. Or have a dance party. 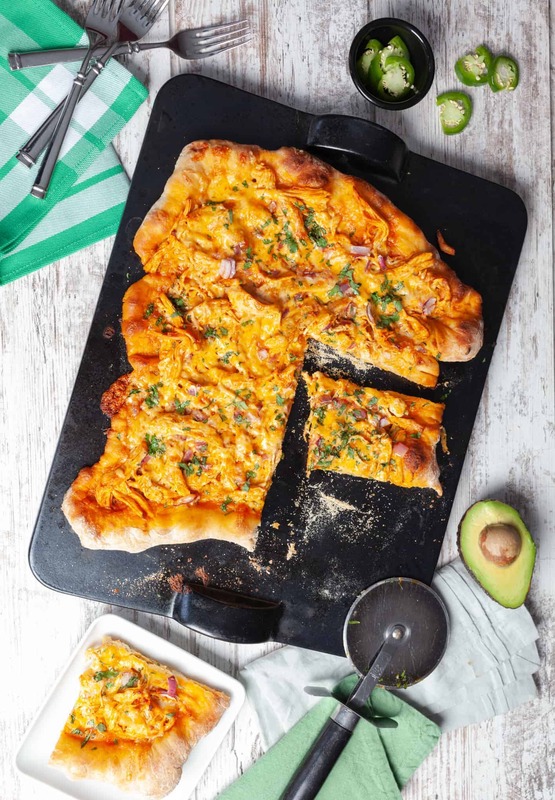 Once the pizza is browned and glorious, bring that baby out and let it sit for a few minutes (trust me, you’ll want to dig right in but your tongue will revolt with an expletive or two) Top it with some cilantro, and have slices of avocado at the ready. Grab your blue cheese, ranch and celery. It’s game day, baby! And if it’s just a typical HO-HUM Wednesday? Well, that works too. one pizza oughta do it! or cut squares of puff pastry to fit mini-muffin cups. top with chicken and toppings and bake according to puff pastry package directions until browned. For dinner or a snack, this pizza is one part heat the other part crunch. Big crowd pleaser especially with the college set. Skip the take out - super easy to pull together at home! Heat oven to 500° and place stone in the oven and heat for at least 20 minutes. If dough is refrigerated, remove from fridge for about 20-30 minutes so it can relax. Sprinkle pizza peel with a decent amount of cornmeal. 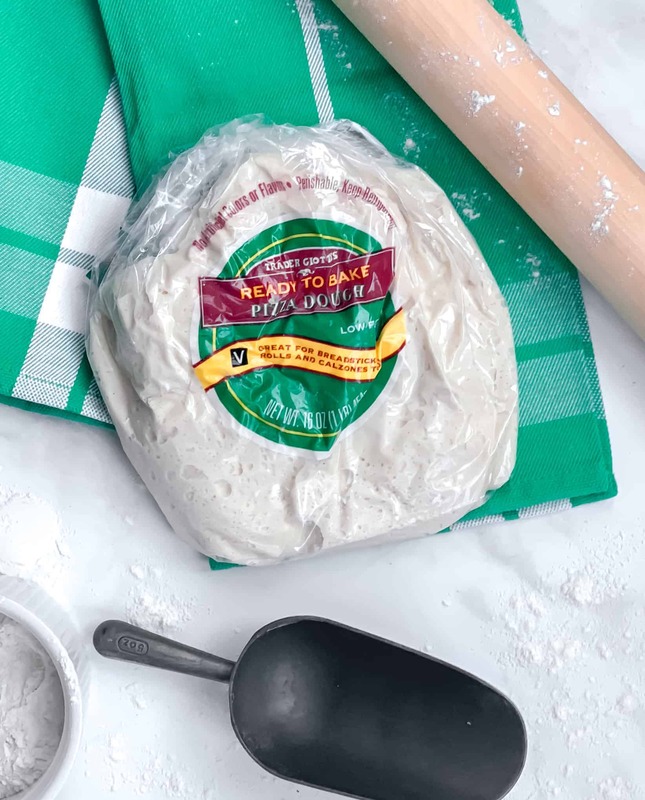 Once you have the dough to the size you want it, lay it on the pizza peel and give it a shimmy back and forth to make sure that it is sliding easily on the peel. Keep checking it from time to time as you progress to the other steps so that the pizza will slide off easily on to the stone when the time comes. If there's a sticking area, just toss some cornmeal underneath. 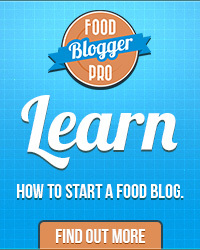 Prepare chicken according to Foolproof Chicken recipe or use a rotisserie chicken. Shred cooked chicken and place in medium bowl. Set aside. Mix hot sauce and butter together in a glass measuring cup. Cover lightly with a paper towel and melt in microwave for approximately 1 minute, checking periodically. Gently stir to combine. Pour hot sauce mixture over chicken and gently toss to combine. Meanwhile, gather other toppings. Using a fork, spread the chicken on the pizza dough making sure that it is spread out evenly across the crust. Layer the ingredients in the following order: bacon (if using), cheese, red onion, green onion, cilantro. Make sure that the crust easily slides on the peel. If it doesn't, gently lift the area where it's sticking and toss some cornmeal under the dough. It should re-slide again. Open the oven door and pull out the rack. Using a back and forth sliding motion, gently transfer the crust a bit at a time from the peel to the stone. It might not be perfect but that's ok! Bake for approximately 10 minutes until golden brown and crisp. Remove and let sit for about 5 minutes and slice. the cornmeal gives the crunch so try not to leave it out. 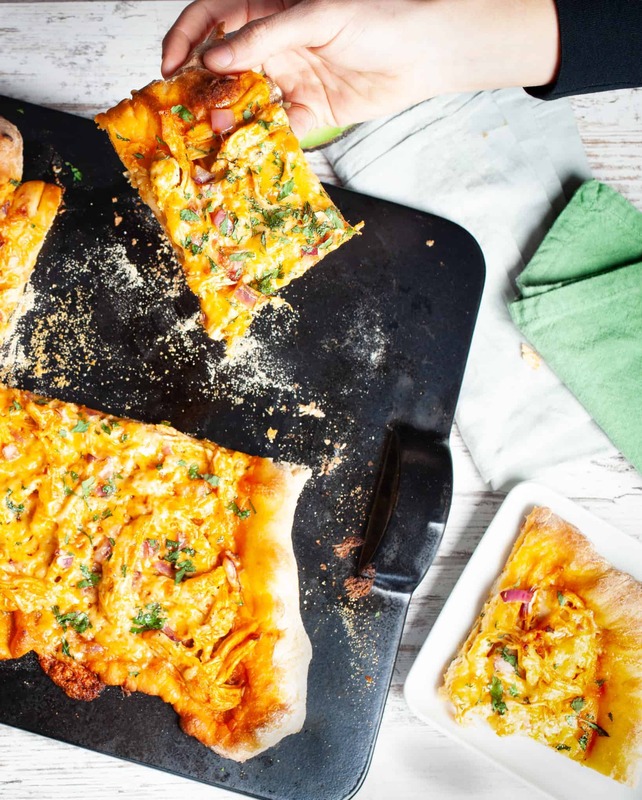 if you don't have a pizza stone, use the back of a cookie sheet or pan.